When applying for a home loan, it’s important to keep in mind how much monthly mortgage you can afford. Through the approval process, lenders will factor in your credit score, income and other financial data to determine the maximum loan amount you’re eligible for, and you may qualify for more than you can afford. 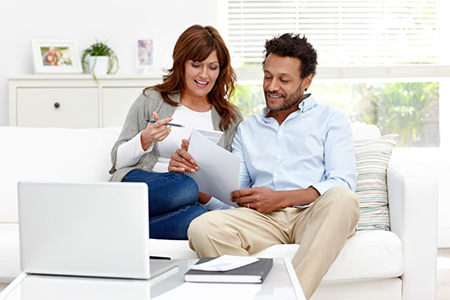 Consider how much you should borrow to keep your monthly expenses and family budget manageable. To start that calculation, find an online mortgage calculator. It should show you the total costs of owning a home beyond the principal and interest of a mortgage. Other expenses can include private mortgage insurance, home insurance, property taxes and HOA fees. Once you have that total number, you can determine if it fits within your monthly budget. If not, then you may have to find a lower-priced house to buy. The Mortgage Reform and Anti-Predatory Lending Act requires mortgage lenders to determine that borrowers can reasonably repay a loan. The decision is based on an applicant’s credit, job stability and income. The law doesn’t allow mortgages to take up more than 35 percent of monthly income. Many lenders use more stringent requirements, limiting a payment to 28 percent of monthly income. Doing the math on how 28 percent of income equates to dollars is easy: Multiply your monthly income by 28, then divide that by 100. That number equals 28 percent of your monthly income. Here’s an example: The median U.S. household income in September 2014 was $51,939, according to the U.S. Census Bureau. That equals about $4,328 per month in income. Multiply that by 28 to get $121,191, then divide by 100 to get $1,211. That $1,211 is 28 percent of the median household’s monthly income. Other debt and expenses, however, may make it difficult to afford paying 28 percent of your monthly income toward a mortgage. Credit card debt, a car loan and student loans will also be looked at by lenders, and if they add up to more than 7 percent of your income you may not qualify for a mortgage that costs 28 percent of your income. Your debt-to-income ratio would be at 35 percent or higher, and a lender may require you to pay off some debts before approving you for a home loan. Contact me for more insights and info.